The exceptionally impressive charity fundraising efforts of one of Webber Independents longest serving members of staff has been publicly celebrated - Moira Staerck Director of Curriculum and who has been working at the School for 28 years, has been made an Honorary Member of the NSPCC Council. Moira has been volunteering and raising funds for the NSPCC for over 18 years, in which time she has accumulated more than half a million pounds for the charity and says her avid support for the charity stemmed from realising how important a good start in life is for young people across the country. Having raised large sums of money being sponsored to take part in multiple marathons and triathlons, in 1999 the determined sportswoman turned her attention to establishing Milton Keynes very own half marathon – a now annual event which has been taking place ever since. 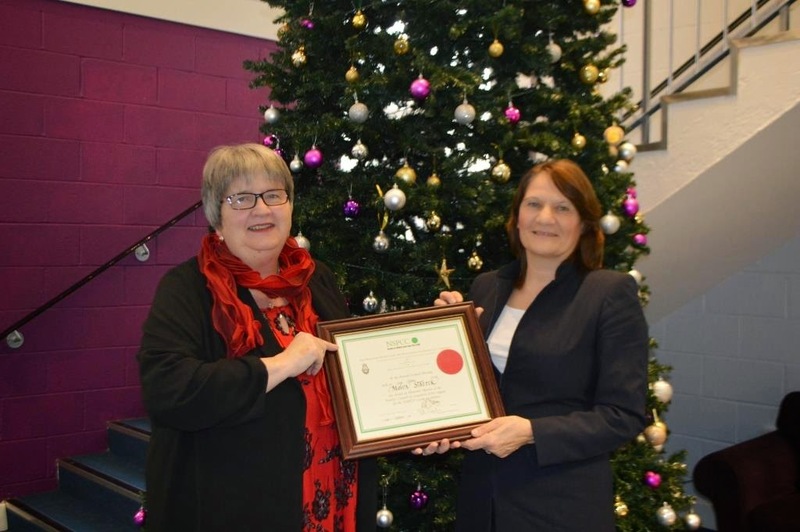 The Honorary Council Membership was officially awarded at a special ceremony held in London in November, however it was also later followed up with a visit to Webber Independent School by Community Fundraising Manager for the NSPCC Sally Phipps, who once again congratulated Mrs Staerck in the end of term Christmas whole school assembly.